ImageCapture is flexible scanning software that is built up of modules. With ImageCapture you cut out a great deal of manual processing. Documents such as consignment notes, CMR documents, manifests, purchase invoices and daily financial records can be automatically processed for the most part and linked to your TMS. These documents can be called up directly from the underlying application. You can scan CMRs in batches by journey, charter, trailer or any other defined parameter. The CMRs are linked to the consignment number in your transport record system. 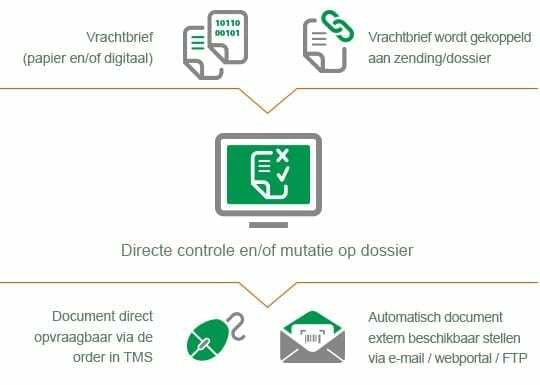 All scanned documents are automatically archived and can be accessed from your TMS and Tracking & Tracing. The combination of the ImageCapture for Documents and ImageCapture for Forms modules allows you to automatically process changes in packaging. Defects and damage can also be recorded. All information is linked with the files in your TMS. Checklists or run sheets are collective documents for transport orders. They are often used for distribution in densely populated areas where one vehicle makes multiple deliveries. You will of course need to show your customers the proof of delivery but will not want them to know who your other customers are. ImageCapture for Run sheets not only makes this possible but is also very easy to use. The software automatically divides the run list into individual lines for each consignment after scanning. Thus you can send individual digital copies of each one to your customers. it supports variable row heights for each consignment. This allows you to expand each line row with full details of goods despatched. In this way the recipient not only signs for receipt of the consignment but also the specified goods. Recognition of a signature. There is no proof of delivery for the customer without a signature and the consignment may have to be delivered again. This information can be processed automatically in your TMS. On our TMS links page you can find a summary of all our TMS links. Is your application not shown on here? Scan Sys is continuously developing new standard links for TMS systems. Please get in touch with us for more information. Less paper used. Instead of having a consignment note for each consignment, various consignment lines can be printed off on one page. Faster processing. A single run sheet can be scanned far faster then tens of individual consignment notes. Signature recognition allows the goods that have not been delivered to be processed far more quickly. The software can be fully integrated in your TMS. Proof of delivery can be sent digitally or made available in your Tracking & Tracing system.